We made this a week or more ago and just forgot to post it… busy busy busy! 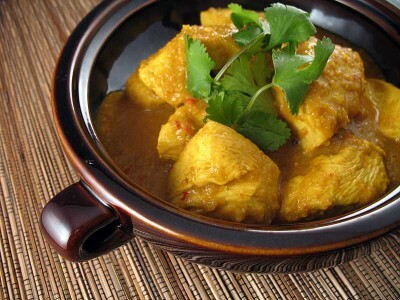 Chicken is simmered in a delicious sauce containing coconut milk, lemon grass, and spices. 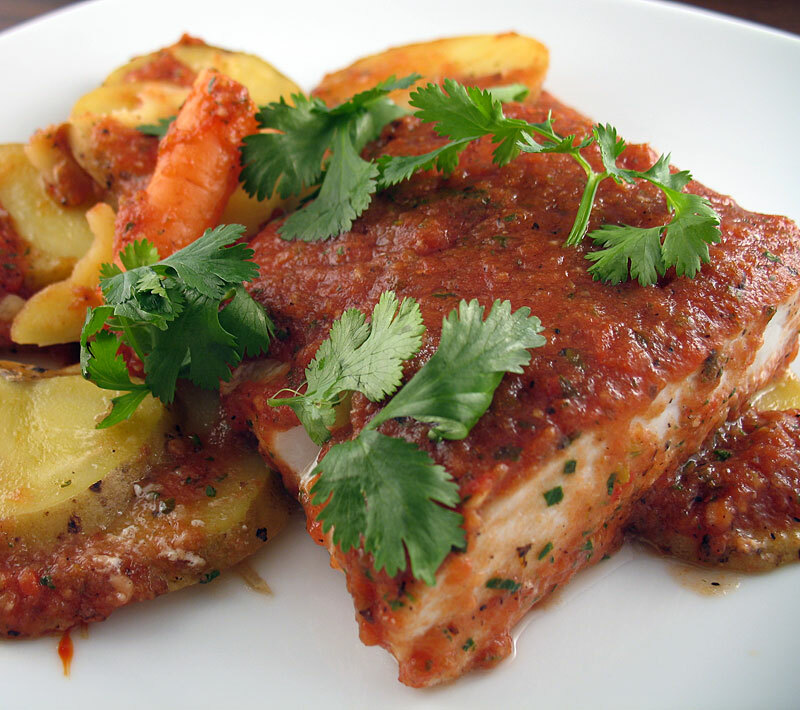 We served it with couscous — delicious! It comes from Asian Flavors. Can we keep this one short? I remember liking this a lot but I don’t remember what I said about it at the time. That sounds like something you’d say, not me. Well… it was… so there. Place the shallots, chili, garlic, lemon grass, ginger, and half the peanut oil in a food processor and blend to a paste. Heat the remaining peanut oil in a wok, add the turmeric and the paste, and fry for five minutes over fairly low heat until the shallots have softened. Gradually stir in the coconut milk, lime juice, and broth and heat until bubbling. Add the chicken and lime leaves and simmer gently for 15 minutes or until chicken is cooked. Last Saturday night we were treated to a dinner at Restaurant Zoë by the Foodbuzz Team, up from the Bay Area. I can’t remember how many courses we had, but I do recall a pretty good Manhattan, multiple bottles of wine, and much to our delight, a meat-stravaganza: tuna! duck! chicken! scallops! pork! It was a great opportunity to try a lot of different dishes; we certainly didn’t go away “hongry”. Traca from Seattle Tall Poppy has posted some pictures @ her flickr pool. Thanks to Ryan, Jen, and Shannon (you guys rock) for putting this event together, and it was great to finally meet you and put faces to names! Okay, we didn’t discover that last one during dinner. But it’s true anyway. For Taste & Create VIII, Lisa and I were paired with Sathya & Elizabeth from The Baker and The Curry Maker: our second Aussie pairing! 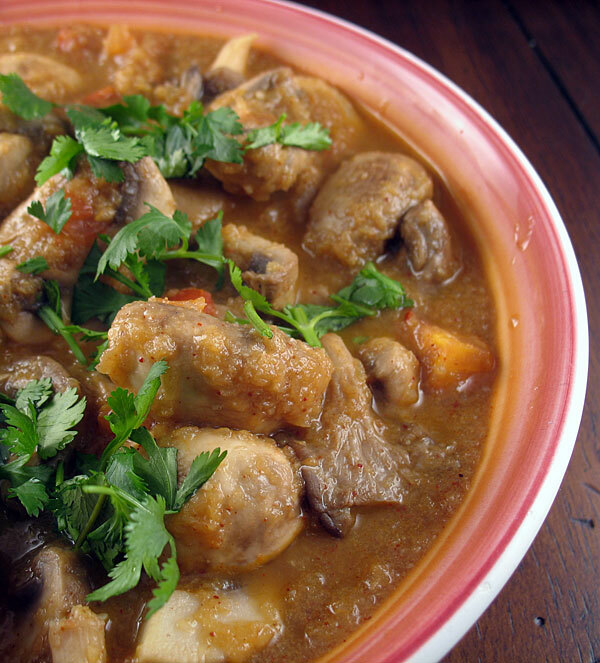 After scouring through a bunch of delicious sounding posts, I decided to make this mushroom curry that Sathya made back in October. Lisa and I are huge mushroom fans (wait — does that mean we love huge mushrooms?) so this recipe sounded just right. It went paired well with a mushroom rice pilaf — the more shrooms the better! That’s pretty obvious — I was just checking out our tag list, and mushrooms clock in at number 2. Seemed like this was pretty easy to make compared to our previous T&C events. Yes — very easy and really healthy! The only difficult part, if any at all, was converting from grams to ounces. Place the ginger, garlic, and onion into a food processor and grind until it makes a smooth paste. Add a little oil to a pan over high heat and stir-fry the mushrooms for a few minutes until they decrease in size and start to give off their liquid. Set aside. Turn the heat to low, add some more oil to the pan if needed and stir in the onion paste. Add the yogurt one tablespoon at a time, and cook for two minutes. Add the tomatoes, ground coriander, chili powder, and salt, and cook for another minute. Add the mushrooms, along with 1/2 cup of water and stir well. Adjust the heat and let thicken, stirring occasionally. Garnish with chopped cilantro leaves and serve. I was pretty happy when I saw that our CSA box this week included arugula, because I’d been wanting to make this salad from Fitness Food a second time — the first time we brought it over to a dinner with Jeremy and Autumn and were without camera. The arugula is tossed with a light olive oil & lemon dressing, and topped with white beans and roasted red bells — who doesn’t love roasted bell peppers? 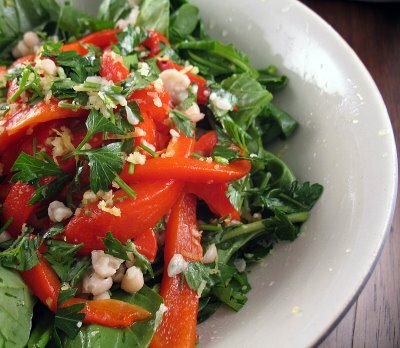 So good — this salad rules! I love roasted peppers; we should remember to make this more often. It’s pretty filling for a salad… and I like the lemon flavor. I’m all for making this again. Roast the red bell peppers by broiling or grilling until the skins are blackened, then place in a bowl covered with plastic wrap. When cool, peel the skin off, remove the seeds and membrane, and cut into strips. Combine the garlic, lemon zest, and parsley, and set aside. Add half the garlic/parsley mix to the white beans, and add half the lemon juice and olive oil. Add salt and apepper to taste. Place the arugula on a large plate and toss with the remaining lemon juice and olive oil. Scatter the beans over the leaves, then lay the pepper strips on top, along with the remaining garlic/parsley mix. Season with salt and pepper.